Nothing is stopping you from your dreams. Well, except you and your perceptions. The one thing in your path that you must come with is a dream or make it plural… dreams. What do you want to achieve? It could be something relatively small, like finding an hour a day to paint or spending more time with your kids. So it doesn’t have to be a big dream. In fact, you can start small and add bigger and bigger dreams. But you need to be clear on what it is that you’re after! You can even borrow dreams from other people or share dreams. For example, to travel. That’s a common dream for a lot of people. But your dreams should be unique to your life. If it’s to be a real estate investor, go after that dream. Take the right education, get involved with real estate-related activities and groups, go to open houses to experience what it is that you seek, DO THINGS that move you toward your dream. Most people THINK they know what a decision is, but the truth is they don’t really understand the process. When you make a decision you CUT OFF other paths. Even if you decide to watch a Periscope livestream, that’s a decision to cut off other things you could be doing. When you actively make a decision to go after your dreams, it means you are cutting off being lazy, cutting off indecision, and cutting off all the choices that have kept you stuck where you are right now. When you decide to take the steps, for example, gaining the knowledge you need to put you in the position to do real estate investing, you will make other decisions… like to NOT watch TV for a couple of hours each day so you can study. You will decide to attend real estate investing events where you can network with like minded people. You will decide to talk to strangers who will end up doing deals with you. Making decisions can be scary for some and challenging for others, but it is absolutely necessary if you’re doing to change your life. Decide to make the necessary changes!! Even if you cut out a single hour a day of watching TV so you could read a book about how to become a real estate entrepreneur, well, that would move you toward your goals sooner. But you have to understand that there is a delay between the moment you make your decision to become an investor and actually gaining the skills to do so. The fact of the matter is that you NEED delays between announcing your dream and making the decision to move forward and then achieving that goal. The delay happens when you’re learning a new skill. But sometimes when learning something new we get discouraged because things aren’t happening fast enough. That’s the time to NOT give up on your dreams!! Here’s something to remember: Every master was once a disaster! You need to take the time to educate yourself and build your skill set before you “suddenly” become a real estate investor. 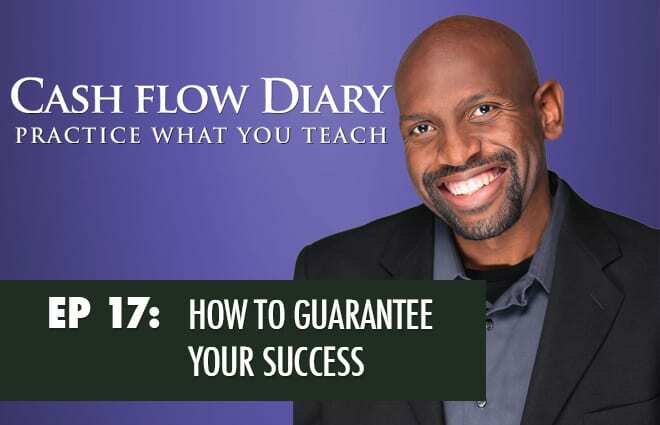 Once you understand that you have to make your way over a few obstacles and challenges… and that you’re going to experience a few failure events… the better off you will be in the long run. You cannot look good while learning something new. It just doesn’t happen. Like learning to walk, you’re gonna fall sometimes… you actually have to crawl before getting up on your pegs. But you will start walking, then running, then jumping over hurdles. That’s the way we learn. Here’s the deal… as you persevere through difficulties you continue learning. Let’s take real estate investing, you are going to have to persevere for a little minute before you have your first success. But you absolutely WILL have your first success… if you continue to persevere. You have to start somewhere. That’s typically training. Then you put what you learn to work and try your hand at it. You may be successful right off the bat, and then again maybe not. It might take you a few tries. But you can’t give up just because there are difficulties and challenges involved. What if some of the top income earners in our country had given up just because of a few difficulties? It would be a boring world, wouldn’t it? Those who take risks and stick through difficulties and challenges as they strive toward their goals ultimately walk away winners. Those who don’t, well, you can visit them at their 9-to-5 J-O-B-S, where they’re told when to arrive, what tasks to perform, when to take breaks and lunches, and when they can go home. We all hit walls and bumps on our path to success. These events may FEEL like a dead end, but they aren’t. When you experience “dead ends” in what you’re doing, you have to pull yourself up and hit the reset button. Then keep going. Once you have made your decision to forge ahead and create the life you desire, there is no turning back. Yes, you will hit walls. So what? Find a way around them. You will encounter big bumps. So what? Climb over them. You may even come up against a dead end, like a deal that can’t go through. So what? There are other roads, other paths and so many other deals you will never run out. You are stronger than you think you are. So take a deep breath, keep learning and keep going. Risk developing a dream. Dare to hope. Make a decision to sacrifice something to get to your dream. Endure the delays in your learning curve. Live through the difficulties. Adjust to “dead ends” knowing there are other courses. You will be delivered to your goals! So how do you get through the six D’s to reach your goals? Borrowing from Saddleback Church’s Pastor Rick, set your faith G.O.A.L.S. He who chases two rabbits end up with none. It’s far better to focus on ONE goal, learn the skills you need to reach that one, and only after you’ve tested your new found knowledge and honed your abilities in that one area should you then move to the next great thing. In real estate that means learn how to be a wholesaler and do a few deals before switching to become a fix-n-flipper or someone who buys rental properties. If you’re interested in buying apartment buildings, focus on getting your first small multifamily before stepping up your game to take on a 72-unit building. Make your goals attainable. For example, if you’ve never done a deal before you can’t realistically expect to do 500 deals this year. That’s not to say the goal is impossible, but it’s probably not a realistic time line. So adjust the time line. Go do that thing. Whatever you want to do is absolutely attainable! You have to break your goals down into bite-size chunks… one step at a time. Your goals must be YOUR goals, individual to you. If you are married, you cannot set goals for your spouse. He/she has to set goals for themselves. You can’t want the goal more than the other person, and others can’t set your goals for you and want them more than you do. One secret to success in real estate investing is to get five yes’s a day, which keeps poverty away. But it’s got to be something YOU want! You must be willing to stare zeroes in the face. You have to be accountable to yourself. If you didn’t set any meetings during a day, well, that’s all you. It’s on you. And you have to watch your pattern over time. Ask yourself…“Why is my pattern the way it is?”For example, if you are going along, setting meetings, raising capital, making money, and then zippo… nada… no activity. Why? Why did that happen? Is that your pattern really? Did something make you uncomfortable with your success? If so what and moreover WHY? Track it and fix it. What can be tracked can be improved! 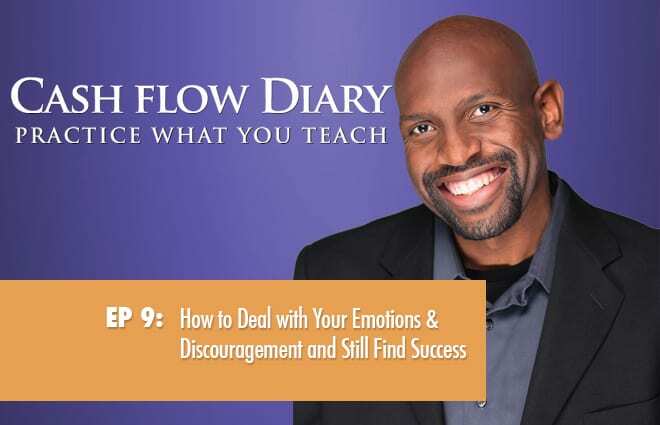 You have to maintain an emotional attachment to what it is you want to do… to your goals. Without the heartfelt connection to your goals you will quit. It is human nature. So BE the person you need to be to get to your goals. Get excited about learning how to serve people through your real estate transactions. One way to get to your goals is to get in front of lots and lots of people. Not doing so will stop you from reaching your goals as a real estate entrepreneur. So how do you achieve this goal? It’s called lead generation and it’s something you gotta do! 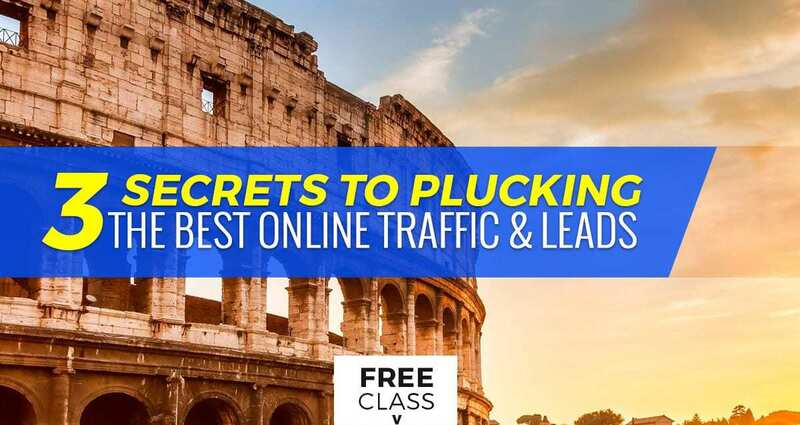 The great news is that there are ways to generate leads wherever you go… and there are ways to generate 20, 30, 50, 100+ leads every day without ever leaving your home. 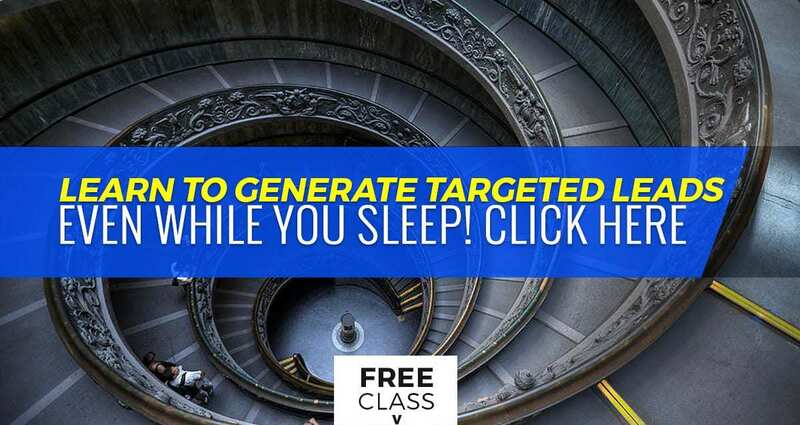 Truth is… you can generate leads even while you sleep. No joke. We do it all the time, week after week, without fail.